Founded in 1886, Australian brand Bunnings is an iconic household name that is recognised Australia-wide. They are the leading retailer of home improvement and outdoor living products across Australia and New Zealand. In partnership with Paddl Co., Bunnings were looking to explore the different types of brand perception amongst their customer cohort through a Paddl Games Event. Paddl Games Events are one-day, hackathon-style challenges, that involve multidisciplinary teams who over the course of the day innovate ways in which to solve a business need. Challenge themes have been diverse - from digital and the environmentally-conscious, to energy saving and growth-based. The ‘Paddl Games: Innovating for Bunnings’ Challenge centred around brand perception amongst various stakeholder groups. Paddl Games Challenges are an effective way for emerging talent to acquire relevant experience valued by employers. Participants are able to learn and demonstrate how they can apply their knowledge and skills in a workplace through design thinking, collaboration and negotiation. Paddl Co. recruits participants for the games from their member base as well as promotion through social channels. Candidates apply for the challenge through Paddl’s jobs board, paddljobs.com. Paddlrs are then competitively selected to form cross-disciplinary teams based on specialty, level of experience, quality of application and interview. Participants came from a diversity of backgrounds and universities; their skills spanning engineering to finance, to the creative arts. 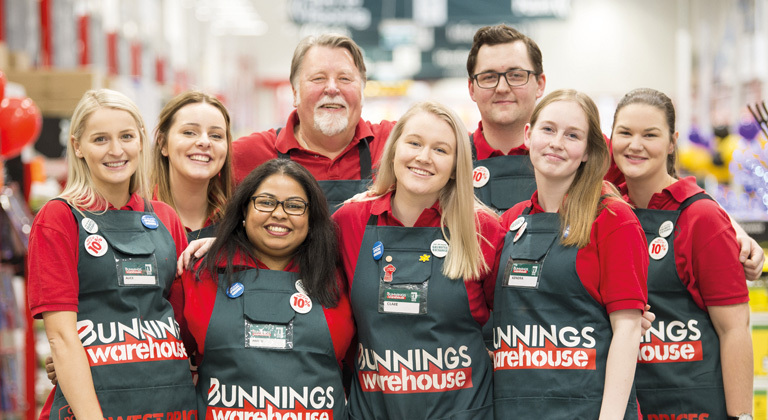 Paddlrs are then placed in teams of 10 students/graduates as well as a member of the Bunnings team whose experience may be as diverse as their own, from project management to finance to HR. The teams are facilitated by one of four professional Paddl facilitators. The day is made up of about 100 Paddlrs, 10 participating Bunnings employees, 4 Paddl Facilitators, about 5 Paddl Crew Members, and 4 HR team members hosting employer booths for each of the Paddlrs to have conversations with experts about their career path. The Games culminated with the 10 teams coming together to present their solutions to the panel of judges. The judges evaluated each solution based on effectiveness of the solution in market, potential of implementation, creativity of the solution as well as relevance to the overall challenge for the day. Bunnings were thrilled with the outcomes of the teams. The winning solution, presented by ‘Free Sausages Are Just The Beginning’, focussed on enhancing engagement of the Bunnings brand with a crucial audience through social media. The simplicity of the solution was commended by judges for not only solving the challenge, but also accurately addressing other criteria such as scalability, potential, creativity and relevance. The day marked a huge success for Bunnings and Paddl! There were a multitude of prizes awarded for pitches and performances to Paddlrs and their teams including Paddlr of the Day. The insight from all the groups left Bunnings with an array of innovative concepts to take with them. If you’re interested in joining the next Paddl Games Challenges, make sure to get your profile sorted today!